Information about Janma Nakshatra Samarambh to be held at Sri Vyasashram, Haridwar. 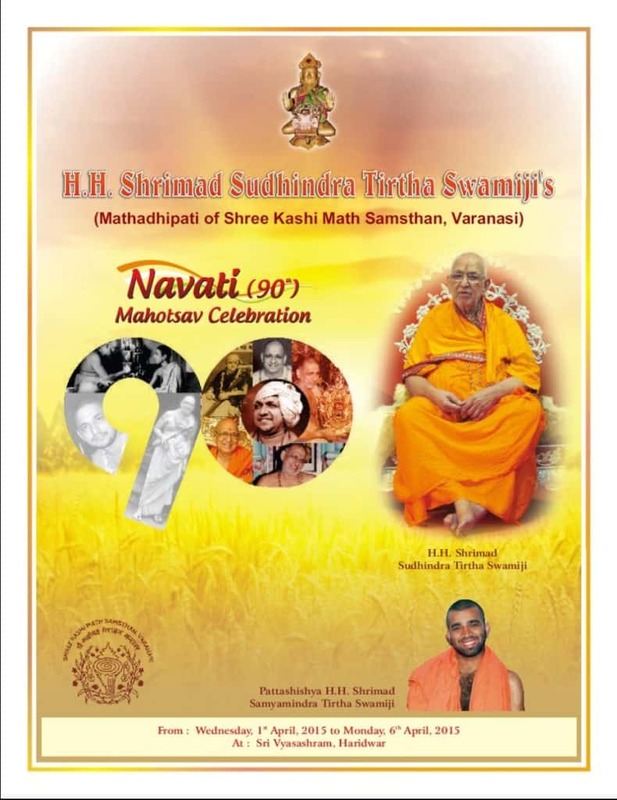 The Navati (90th) Janma Nakshatra Samarambh of our Parampujya Dharmaguru H.H Shrimath Sudhindra Thirtha Swamiji, Mathadhipati of Shree Kashi Math Samsthan, will be celebrated on a grand scale from Wednesday|April 1, 2015 to Monday|April 6, 2015 (Swati Nakshatra Day) at Sri Vyasashram, Haridwar. 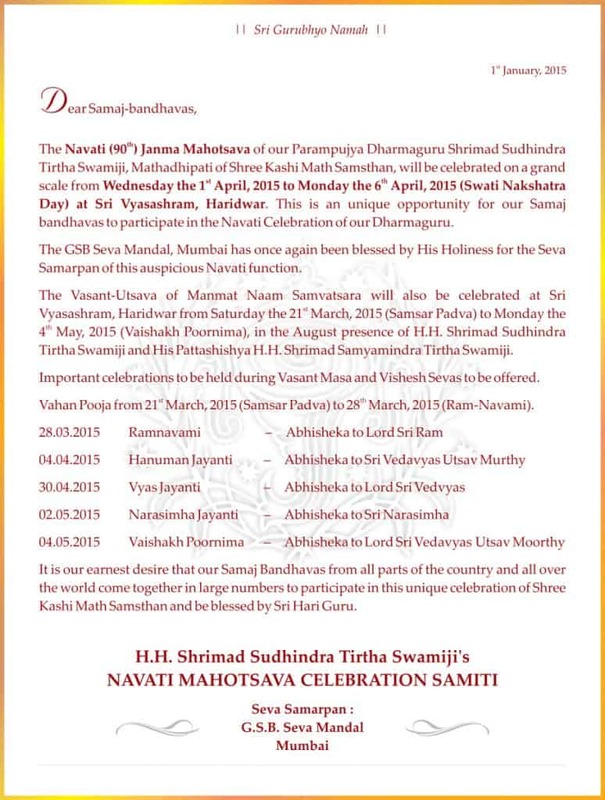 This is a unique opportunity for our Samaj bandhavas to participate in the Navati Samarambh of our Dharmaguru. The GSB Seva Mandal, Mumbai has once again been blessed by His Holiness for the Seva Samarpan of this auspicious Navati function. 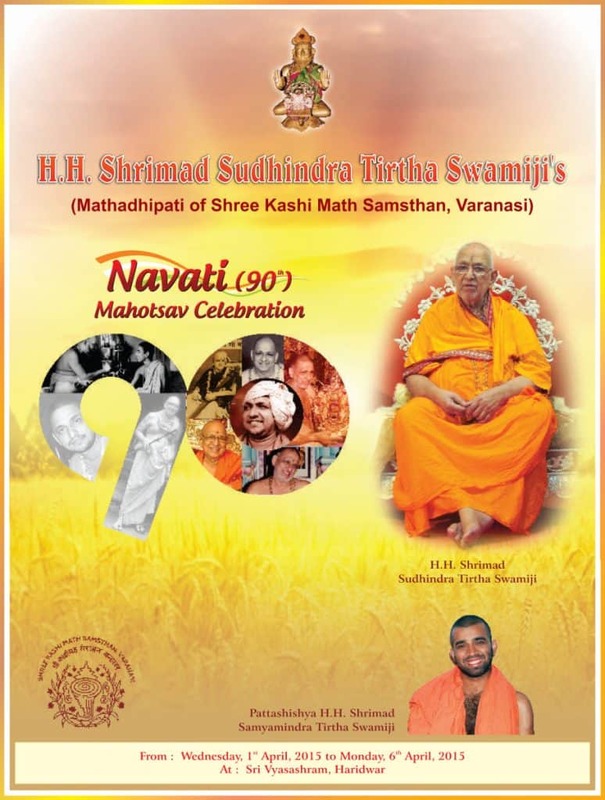 Shree Samsthan’s Vasanthotsav of Manmat Naam Samvatsar will also be celebrated at Sri Vyasashram, Haridwar from Saturday|March 21, 2015 (Yugadi) to Monday|May 4, 2015 (Vaishakh Poornima), in the August presence of H.H Shrimath Sudhindra Thirtha Swamiji and their Patta Shishya H.H Shrimath Samyamindra Thirtha Swamiji. 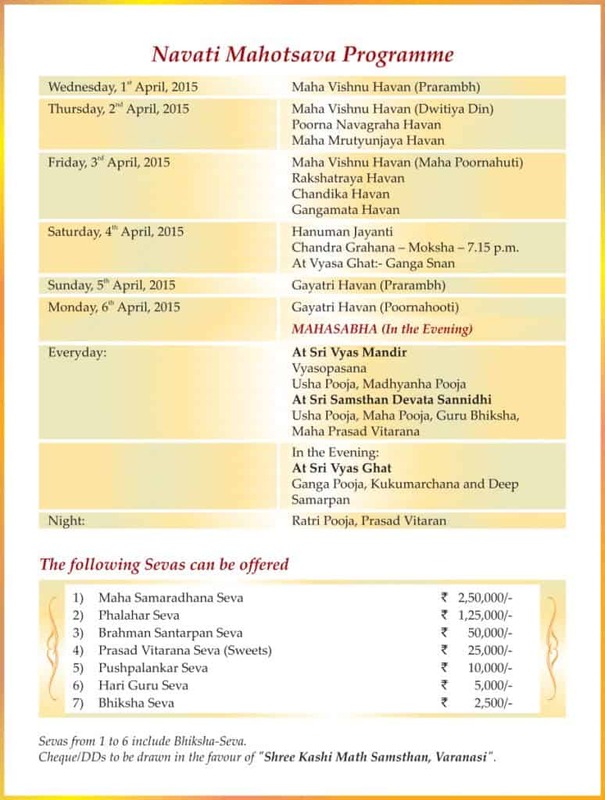 Vahan Pooja from 21s March, 2015 (Samsar Padva) to 28″ March, 2015 (Ram-Navami). 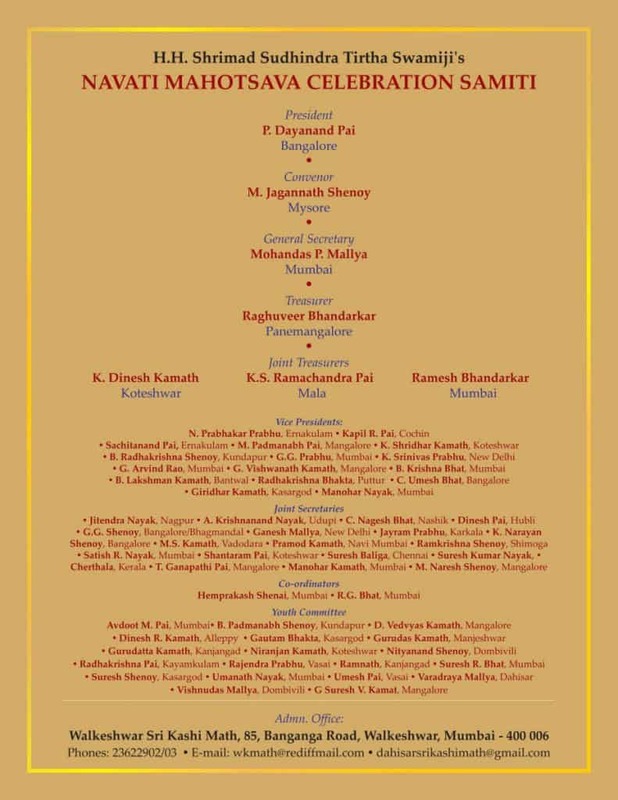 It is our earnest desire that our Samaj Bandhavas from all parts of the country and all over the world come together in large numbers to participate in this unique celebration of Shree Kashi Math Samsthan and be blessed by Sri Hari Vayu Guru. Sevas from 1 to 6 include Bhiksha-Seva. Cheque/DDs to be drawn in the favour of “Shree Kashi Math Samsthan, Varanasi”.